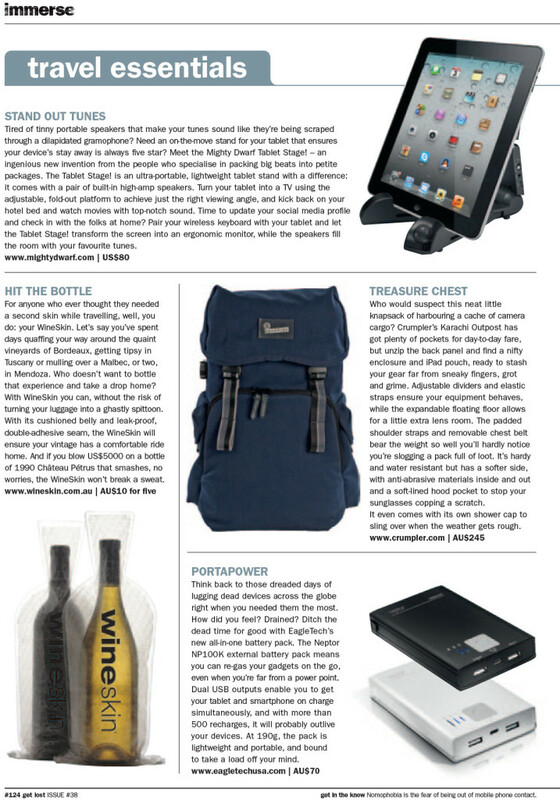 For anyone who ever thought they needed a second skin while travelling, well, you do: your WineSkin. Let’s say you’ve spent days quaffing your way around the quaint vineyards of Bordeaux, getting tipsy in Tuscany or mulling over a Malbec, or two, in Mendoza. Who doesn’t want to bottle that experience and take a drop home? With WineSkin you can, without the risk of turning your luggage into a ghastly spittoon. With its cushioned belly and leak-proof, double-adhesive seam, the WineSkin will ensure your vintage has a comfortable ride home. And if you blow US$5000 on a bottle of 1990 Château Pétrus that smashes, no worries, the WineSkin won’t break a sweat.